What are Dental Implants or Tooth Implants? Dental Implants in Mumbai- A Dental Implant is a titanium anchor placed firmly into the jaw bone to hold the artificial teeth. It is an artificial replacement for the root portion of your natural tooth. Implants support a crown, a bridge or secure denture firmly in place. They are ideal option for replacing missing teeth as they last a lifetime. In function and aesthetics, they are very similar to natural tooth. Tooth Loss is a very common problem. Tooth loss can happen because of trauma or fall, decay and extraction or gums problems and bad oral hygiene. When a Tooth falls or loses a tooth, it creates a gap in the teeth due to the missing tooth. You dentist will tell you that the lost tooth must be replaced to ensure gum recession and avoid further tooth loss. Your dentist can replace the missing tooth by a dental implant. A dental implant is the best option for replacement for missing teeth because it provides a combination of functionality and aesthetics which are as close as possible to the natural tooth. It is placed by an expert in Dental Implants called an Implantologist. We also provide easy EMI options for dental implants in Mumbai. Dental Implants are used by dentists to replace missing teeth. Traditionally, dentist would replace a missing tooth with either a dental bridge which is a combination of two or more dental crowns or a removable dental prosthetic called a RPD or a Denture. But in modern times, Dental Implants are the most effective method for replacement of missing or lost teeth. The process used for placement of the dental implant and the surgery used for the same is dependent on the dental implant being used (i.e. the brand or company, size of the implant, length of the implant etc.) and the bone or jaw anatomy. The total process of the replacement of the missing tooth would take 4 to 6 months which includes three primary phases. The first phase is surgery in which the dental implant in screwed into the jawbone. The second phase is that of healing and osseointegration (ie. is the time during which bone is formed around the implant to anchor it into the jaw. The third phase is of placing a crown on the implant to give the dental implant screw a tooth like look and functionality. This is a minor surgery which is the actual screwing of the Implant into the bone. This surgery is generally performed under general anaesthesia and takes approximately 1 hour. The dentist would open the flap of your gums by cutting the same with a scalpel. 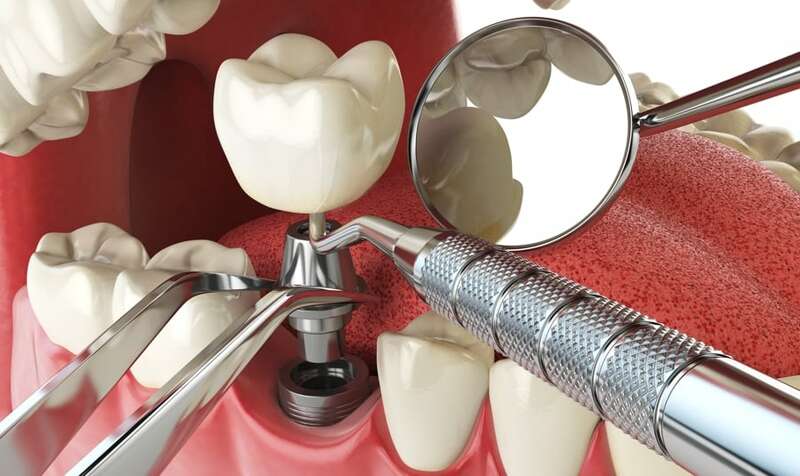 After which, the dentist will drill a hole for the dental implant to be placed. The hole may be tapped to create screw threads matching the threading on the implant. The implant is then screwed into the bone. The gums are then stitched up for healing. The implant after screwed into the bone would go below the jawline and hence even after the surgery you will be able to see the gap of the missing teeth. This phase is where the implant gets integrated into the bone and gets anchored to form the root of the missing tooth which is being replaced. This is essentially is a waiting phase during which the dentist just checks for bone growth and implant stability for 3 to months. Once the implant is completely completely integrated into the bone, the implant would be then ready for the third phase of capping or crowing the implant to provide for the missing tooth. When the dentist confirms that the implant is completely integrated into the surrounding bone and hence is stable, the dentist will now prepare for placing the abutment on the implant. The abutment is a seat on which the final prosthetic or the crown / cap will be cemented or screwed. This is a small surgery where the dentist will again cut open the gums (open the flap of the gums / gingiva) so that he gets access to the implant under the gums. He will put the abutments onto the implant and fix it using a screw. The dentist will then stitch up the gums and wait for the gums to heal. After this step, you will be able to see a metal seat / abutment protruding out of the gums in the place of the missing tooth. After 1 or 2 weeks, the gums around abutment get healed and the dentist can now take an impression and measurement for designing and preparing the crown or cap. Depending upto the type of crown, which can be a porcelain fused to metal crown (ie. PFM) or a Zirconia crown, that is to be put on top of the implant, the impression site is prepared using components like impression copings and posts. The dentist uses an impression taking material which is used to create an impression of the abutment, surrounding gums and adjacent teeth which will be used by the dentist and the dental laboratory to create a prosthetic crown or cap that fits perfectly on the abutment seat. The dental laboratory may take a week to create a crown or cap and deliver the same to the dentist. After 1 or 2 weeks the dental laboratory will send the trial crown or cap to the dentist for checking its fit inside the patients mouth on the abutment seat. If the dentist feels there are any changes which are required then the dentist will send the crown back to the dental laboratory for the same. If the crown fits perfectly and to the satisfaction of the dentist then the crown will be screwed or cemented on the dental abutment to complete the tooth replacement process. This is the completion of the tooth replacement process and you will now have the missing tooth replaced with an almost near natural functionality and aesthetics because the dental crown and the dental Implant will look and behave almost like a natural tooth. Click here to know the pricing for Dental Implants in Mumbai. Click here to book an appointment for Dental Implants in Mumbai.